"Ant-Man." You have to laugh at it. It's a name that's screaming to be made fun of, a relic of goofy 1960s-era comic-book-making. But, while there's tons of humor in the first issue of the Marvel character's new series, Ant-Man #1 will pull at your heartstrings, too. The timing couldn't be any better for Ant-Man #1, which debuts just hours after the trailer for Marvel's next big superhero flick. Like the promo clip hat preceded it, the new comic by Nick Spencer and Ramon Rosanas focuses on ex-con Scott Lang, a perpetually down-on-his-luck divorcee who just happens to fight crime while riding little widdle bugs. This isn't another rehash of an origin story, though. The comics version of Lang has been around for a few decades now and Spencer deftly recaps the highs and lows of the character's fictional biography. As a superhero character who's a divorced parent, Lang is clearly a product of the 1970s, when fiction about the fracture of the nuclear family came into the mainstream. It's also provided a nice bit of tonal separation from other more, well-adjusted characters, which Spencer leans into heavily here. When Marvel's plans to make a movie about its size-changing, insect-controlling hero came to light years ago, the response from many was, "Why will anyone care?" Ant-Man #1 offers plenty of reasons. Spencer's dialogue for Scott Lang casts him as a bit of a lovable rogue/loser, a guy who's broken rules for mostly good reasons and who's tried to balance his karma in the aftermath. The first issue places him in close proximity to Tony Stark, a shrewd move that puts him closer to the A-list of movie-star Marvel characters. Despite being a member of the Avengers, Scott's flat broke and he needs to nail a job tryout so he can pull down a steady salary from the guy who's also Iron Man. Lang's court-restricted relationship to his daughter plays a central role in these pages and will probably figure largely in the issues and movie to come. If you're mourning Spencer's excellent work on The Superior Foes of Spider-Man—one of Kotaku's favorite comics of 2014—this first issue will fill the void left by that book's cancellation. The tone here is comedic but bittersweet, shot through with self-doubt and self-aware yearning that believably channels the angst of being a middle-aged dude. Rosanas' artwork stages the size-changing action nicely, rendering the environmental scale and emotional weight in character interactions well. Scott Lang makes a big decision at the end of this first issue and readers are left wondering whether it'll be either another screw-up or unlikely triumph for the man who stole his way into superherodom. 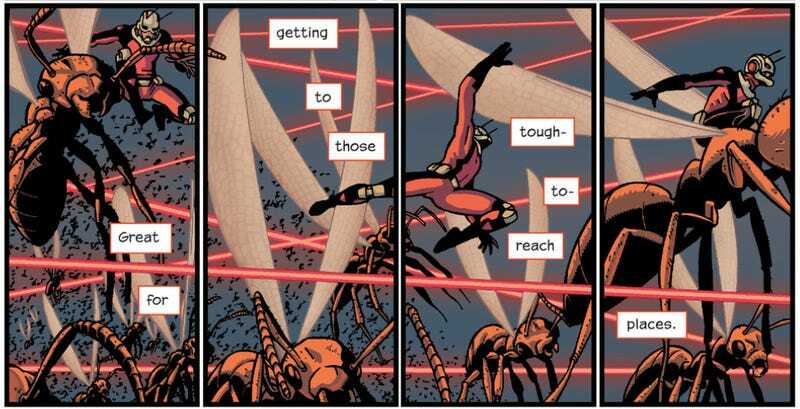 Ant-Man #1 makes a good case for caring about Lang and the upcoming movie focused on him.